The Commodore PET, designed by Chuck Peddle, was originally offered to Radio Shack. 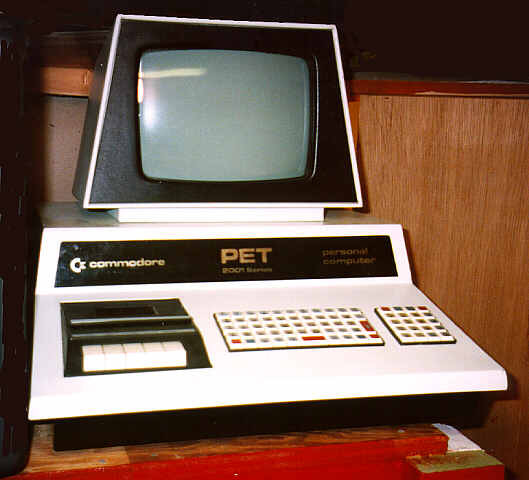 When Radio Shack turned him down, the PET was produced by Commodore Business Machines. The version shown at the West Coast Computer Faire was a prototype in a rounded plastic cabinet. This proved impractical for both durability and RF emissions reasons, and was replaced prior to production with the classic angular metal enclosure shown here. The early systems were widely derided for their "chiclet" keyboard, so Commodore soon offered two optional full-size keyboards; the "graphics" keyboard and the "business" keyboard. The Computer Closet also contains a Commodore PET 2001-32N with the full-size graphics keyboard. The full-size keyboard versions used an external cassette drive. The PET never met the level of success of the Apple II, but its basic architecture continued in the Commodore VIC-20 and eventually the Commodore 64.